Thanks to my daughter Emily for this recipe…and much more. She has been invaluable these past few months and I simply could not have accomplished a move without her (next Saturday is MOVING DAY!). Helping me get my home ready to go on sale; giving me a place to crash through 4 weeks of nonstop showings and now helping me organize, pack and move to storage from the home I’ve lived in more than 2 decades is a huge undertaking in itself. That she has also helped me in the preparation of healthy foods for Lauren AND writing the post today? Well, words simply can not express how grateful I am for her help. I did store 14 cases of booze at her place…maybe a cocktail or ten will help to soothe her weary back! Anyway, thanks for making this Spinach Lasagna Em; I stole a bite or two and I LOVED it! This particular recipe was featured on Cook’s Country not long ago. I decided to make this for #Waunstrong Wednesday as it is packed full of nutritious leafy greens but also tastes amazing. I love spinach, whether raw or cooked, and this recipe does not shy away from the leafy green. If you’re not keen on the green, you’d probably be better off making something else; but if Popeye is your homeboy, you’re going to love it. Creamy ricotta and mozzarella are stacked in layers along with the spinach and a simple tomato sauce which makes for a hearty and satisfying meal. As a meatless alternative to traditional lasagna, this flavorful version provides vitamin-rich and healthy leafy green vegetables. If you’re so inclined, I’m sure you could doctor it up and add some mushrooms or zucchini, but the amount called for in the recipe filled our casserole dish perfectly. Although this is not a difficult recipe, it is certainly made easier if you have a food processor to help in the prep work and using no-boil noodles cuts down on time. We made a full recipe of this lasagna, then divided it up and packaged it into individual servings with a Food Saver and froze them so Lauren could have some quick go-to meals that she could simply reheat at work. 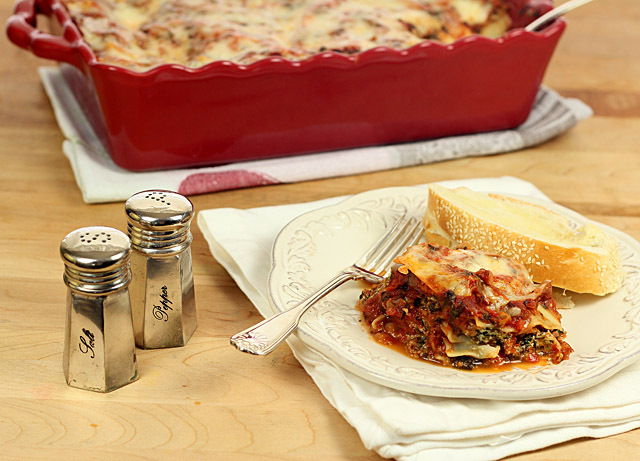 A great vegetarian lasagna option filled with spinach and a tasty sauce. Microwave spinach in covered large bowl until completely thawed, about 15 minutes, stirring half-way through. Squeeze spinach dry, reserving 1/3 cup liquid. Pulse spinach in food processor until ground, 8 to 10 pulses, scraping down bowl every few pulses. Wipe out large bowl with paper towels. Transfer spinach to now-empty bowl; set aside. Process ricotta and reserved spinach liquid in food processor until smooth, about 30 seconds. Add parmesan, remaining 3 tbsp basil, eggs, 1 ½ tsp salt, and ½ tsp pepper and process until combined. Stir ricotta mixture into remaining processed spinach. Cover bottom of 13 by 9-inch baking dish with 1 ¼ cups sauce. Top with 3 noodles and spread one-third of ricotta mixture evenly over noodles. Sprinkle with 2/3 cup mozzarella and cover with 1 ¼ cups sauce. Repeat twice, beginning with noodles and ending with sauce. Top with remaining 3 noodles, remaining sauce, and remaining 1 cup mozzarella. Cover pan tightly with aluminum foil sprayed with vegetable oil spray and bake until bubbling around edges, about 40 minutes. Discard foil and continue to bake until cheese is melted, about 10 minutes. Cool on wire rack for 30 minutes. Serve. Freezing portions for meals has worked so well for Lauren that I’m wondering why I’ve not done that for myself…good idea Em! Why yes, Emily… Popeye IS my homeboy! And now I need to make this fantastic vegetarian lasagna. It sounds wonderful! This is a great way for me to eat more spinach and the individual portions are a good idea for me too since my husband would prefer a meatier lasagna. Great guest post! Hope to meet you and Lauren one of these days, Emily! Hi Emily!!! I love Cook’s Illustrated as well since I also love the “geeky” side of cooking!!! I saw this recipe and had it bookmarked but never got around to making it. After seeing this post, have definitely moved it up on the list of things to make! I prefer a vegetarian version of lasagna over a heavy meat filled one any day. What nice photos of one of my favorite dishes. Way to go, Emily! Both for helping your mom in so many ways and for making this absolutely delicious looking lasagna. Could you ship one of these to Georgia, please? In time for dinner? Vegetarian lasagna is about the only lasagna we eat any more. This sounds fabulous to me! 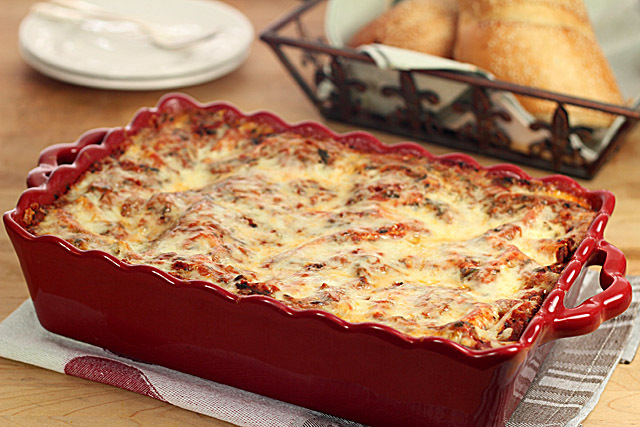 I love spinach, this is my kind of lasagna! Great recipe, Barb & Emily! 🙂 I love a good vegetarian lasagna! I made homemade pasta for the first time last week. I made spaghetti. I have been wanting to make lasagna with my homemade pasta. I might try out this recipe with it. I bet it will taste great! this sounds absolutely wonderful – I love anything with spinach. good luck with the move, I hope it all goes smooth! Nice recipe! 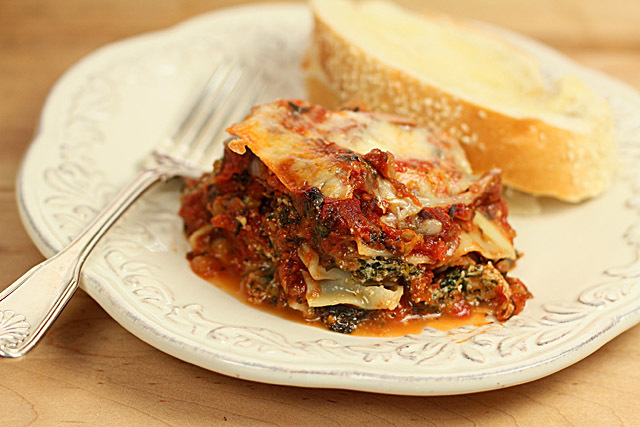 I sometimes make my own lasagna noodles using spinach, but I should try it this way sometime, too. We ditched cable for an antenna, too, and we’re not looking back – don’t miss cable at all. And I have a massive collection of Cook’s Illustrated that I need to get rid of. For the past few years I’ve been subscribing to their electronic version – you get it online only, no paper. But the big benefit is you have access to all the back issues in electronic form. So easy to search! Anyway, nice guest post – thanks. Healthful and delicious, lets eat! I am a ATK devotee too Emily. Love their Family Cookbook. There isn’t a recipe in there that isn’t wonderful. I haven’t made this one, but I plan on it now. Great post Emily and wonderful looking lasagna. Enjoy browsing through those back issues of Cooks Illustrated. Hoping having those in your possession will lead to more guest posts here! I do love spinach… And it’s even better when combined with pasta and cheese. You certainly have a lot going on but it sounds like your daughter has been incredibly helpful with both your move and Lauren. Wishing you all well.